OBV’s Parliamentary Shadowing Scheme graduated in the House of Lords yesterday with MPs and the graduates celebrating the end of the six month mentoring programme and looking forward to the start of many potential parliamentary careers. The thirty-one dynamic Black and Minority Ethnic individuals each hoping the connections made and the experience gained has put them on the road to Westminster, as one participant said ‘this is just the start of my journey into public and political life’. The Graduation Ceremony included mentors and speakers Baroness Scott, Fiona MacTaggart MP, Shadow Equalities Minister, Elfyn Llywd MP, Parliamentary Leader of Plaid Cmyru and Stephen McPartland MP. Who all said they too had learnt a lot from the experience of mentoring the shadows and they all stressed the need to ensure that Parliament reflects the people it serves. Liza Davis, from the US Embassy Cultural Attaché spoke about the relevance of Martin Luther King Day which is a national holiday in the States, and quoted Barack Obama. OBV Director Simon Woolley said; "This organisation and these schemes have produced so many firsts: Baroness Sayeeda Warsi, first female Cabinet member from a Muslim community, who was part of the OBV project in the North of England. Helen Grant MP, OBV shadowing alumni who became first Conservative woman of African descent and Gurpreet Dosanjh, OBV shadowing alumni who was the first Asian to become a party Leader’s Private Secretary when he was appointed by Lib Dem leader Charles Kennedy. I am convinced this latest group will continue to break new ground and take their place in positions of power”. Stephen Bediako who shadowed David Miliband said; “This was a supportive introduction into British politics. I have come away with a set of great friends and a new family in the OBV team and I have gained a realistic, inspiring and enthusing exposure to the world of political office". The ceremony concluded with a graduation certificate presentation; the shadows received their certificates from Sadiq Khan MP for Labour, Sir Menzies Campbell MP for the Liberal Democrat and Andrew Stephenson MP for the Conservatives. Elfyn Llywd and Simon Woolley also made presentations. 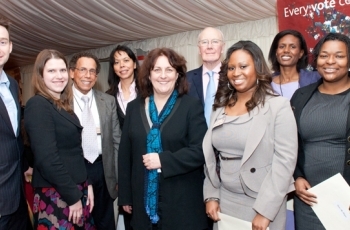 Programme mentors included MPs and Peers from all the three main parties including Cabinet Minister the Rt. Hon Oliver Letwin, CLG Parliamentary Under-Secretary of State Andrew Stunell and Party Leaders Ed Miliband, Caroline Lucas and Elfyn Llwyd. The Scheme’s overall strategy is to encourage BME communities to positively engage and be better represented within our political and civic institutions. Main picture: Liberal Democrat Parliamentary Shadows and Former Party Leader Menzies "Ming" Campbell, John Leech and Jo Swinson. Submitted by Fevzi Hussein (not verified) on Wed, 19/01/2011 - 02:13. I attended the event and have to say well done to all at OBV. The value of the work you all do can never be truly appreciated.